I imagine most MOCs start the same way: a simple idea that quickly gets out of hand. This “Avengers HQ Modular” MOC started with 76007 Malibu Mansion Attack, a nice little set from Iron Man 3 that we got for my son for his birthday. It was a nice enough model of a section of Tony Stark’s lab and hall of armor, with space enough for a couple of Iron Man suits to stage battles with The Mandarin. The problem was, my son had an Iron Legion of 16 suits that needed to move in. At first, we ended up building a haphazardly constructed two-level armory (not the MOD you see here) that held all of the armor as sublevels below the Mansion. 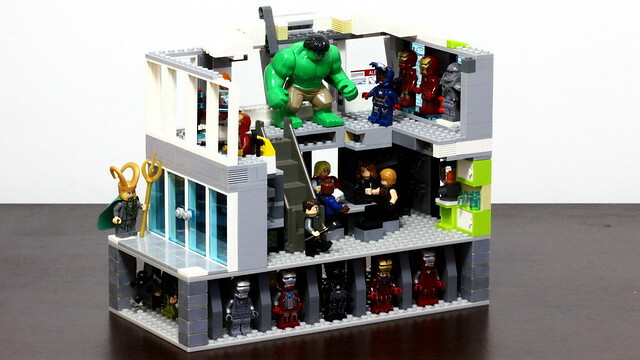 It followed the strange angles of the Mansion, and ended up being lopsided, so it was a bit of a nightmare to move around and stow away when it was time to clear the dining table of the day’s minifig superhero battles. Things got even messier when you had the rest of the Avengers join Stark in the Mansion. Poor old Hulk was always left to stand outside the building.